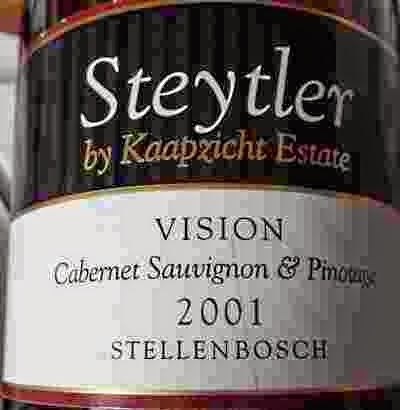 My Wine of the Month for April is Kaapzicht Estate’s ‘Steytler Vision’ 2001. This was a very easy choice because it was by far the best and most enjoyable wine out of all I drank during the month. It’s a Cape Blend. 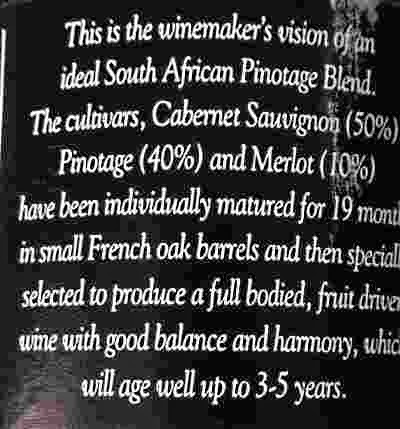 The front label says Cabernet Sauvignon and Pinotage, with 50% of the first, 40% of the second and complemented with 10% Merlot according to the rear label. I didn’t have high hopes of this 14 year old wine when I attempted to open it. The cork just crumbled into dust, avoiding all attempts at removing it and the remains of it had to be pushed into the bottle and the first poured glass was unusable as it was filled with dust and cork debris. But the second glass was sublime. So much flavour, with sweet fruit, rich and ripe a background of soft tannins. It was a wine to make one stop in wonder. The rear label says it ‘will age well up to 3-5 years’, but 14 years after vintage it is going strong, and although browing slightly at the edge seems youthful and full of life. Unfortunately that was my last bottle, number 3,461 of 9,000. The bottle had been stored by me in good conditions on its side. 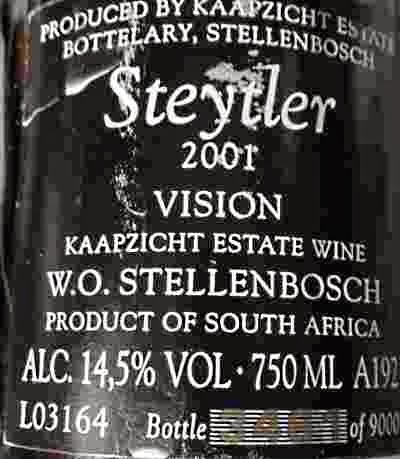 The 2001 Vision vintage was rated 5 stars in Platter and in 2004 won the Chateau Pichon LonguevilleComtesse de Lalande Trophy for best red wine at the International Wine & Spirits Competition, London.